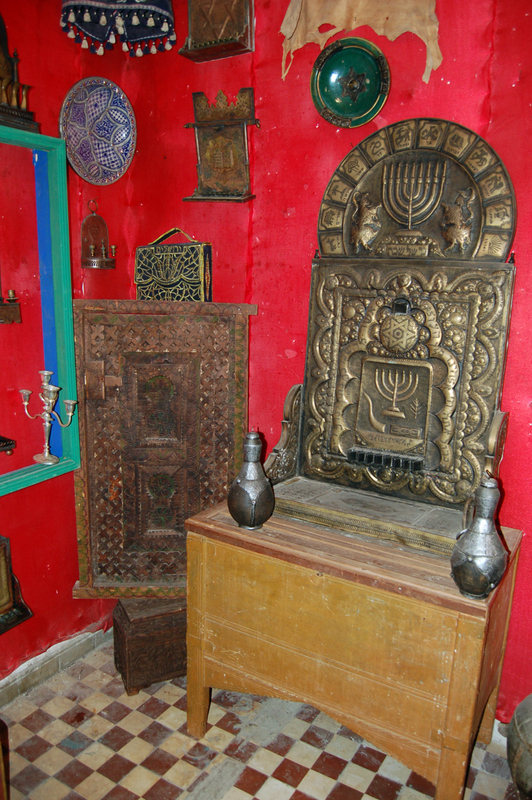 The following images present important elements of Jewish heritage in areas that became predominantly Islamic cultural areas. 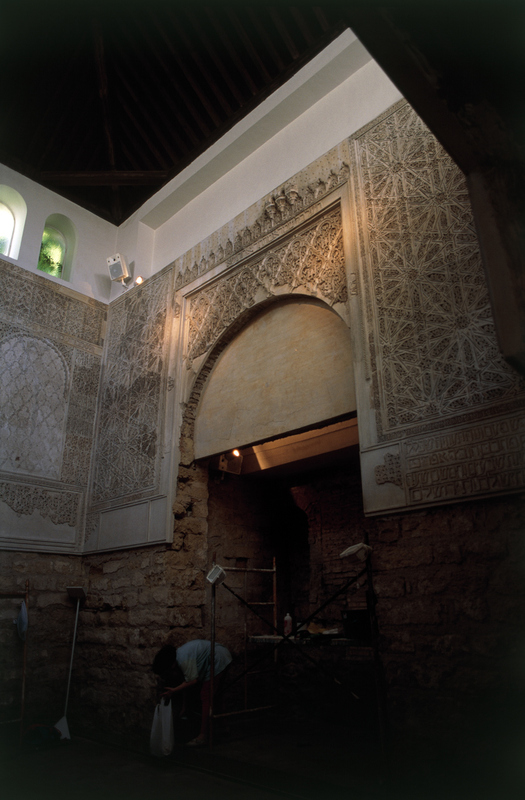 I have had the opportunity to visit these sites during my travels as I have studied the movement of Christianity from Spain into the New World, and later during a project to provide visual resources for teaching Islamic cultural history. 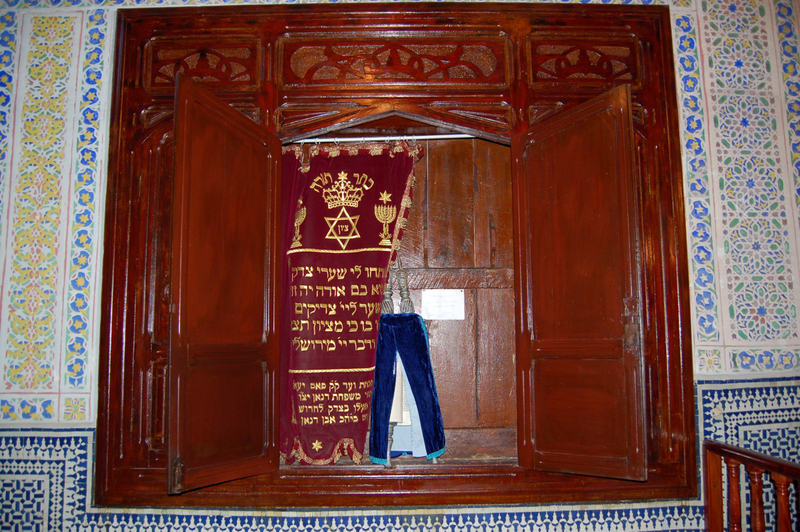 In Spain and elsewhere the Jewish presence was an important part of the overall history and cultural evolution, and as these images demonstrate, one can find common threads in the examples of the material cultures of Jewish, Christian, and Muslim traditions. 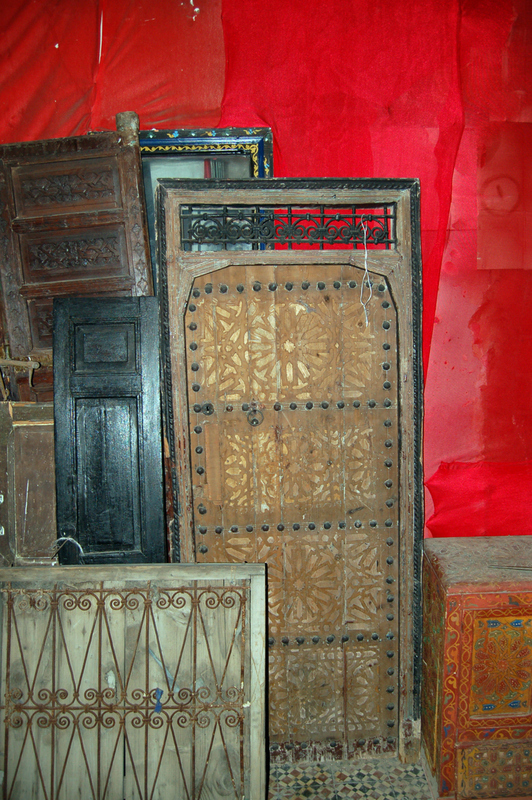 I reserve all rights to the following images. 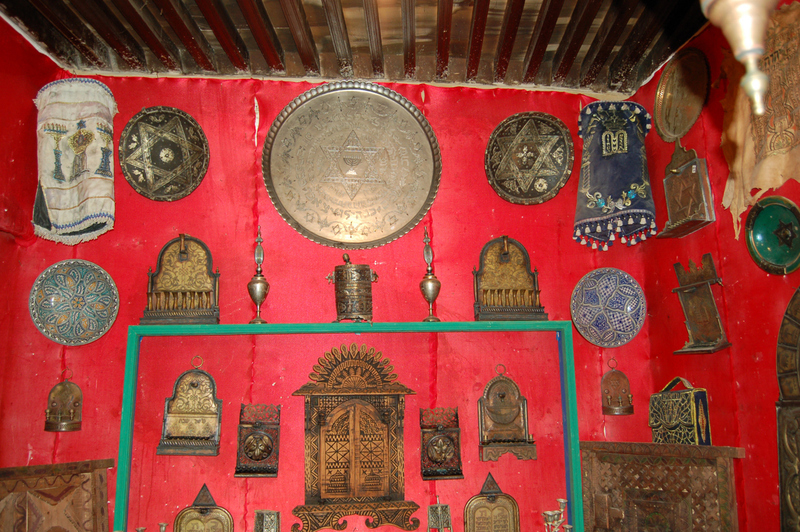 They are provided free of charge for educational purposes here, and may be freely accessed for viewing within the context of this website for educational purposes. 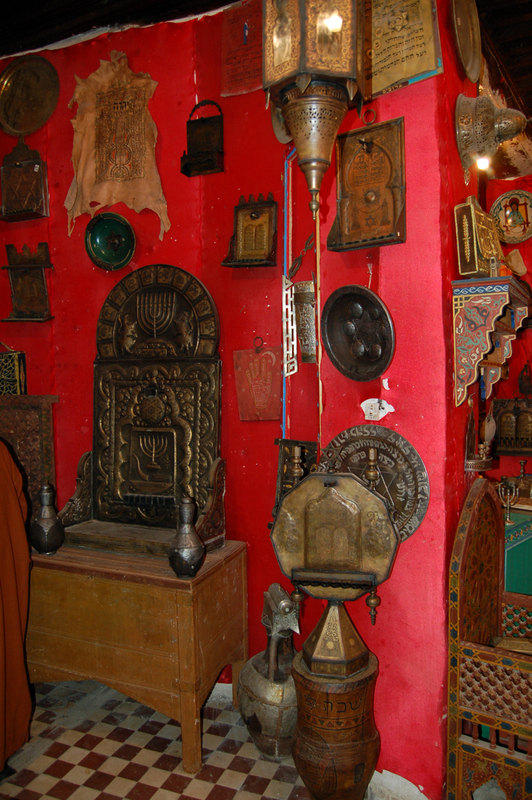 However, these images are protected by copyright law and may not be copied for any purpose by any means without prior permission. 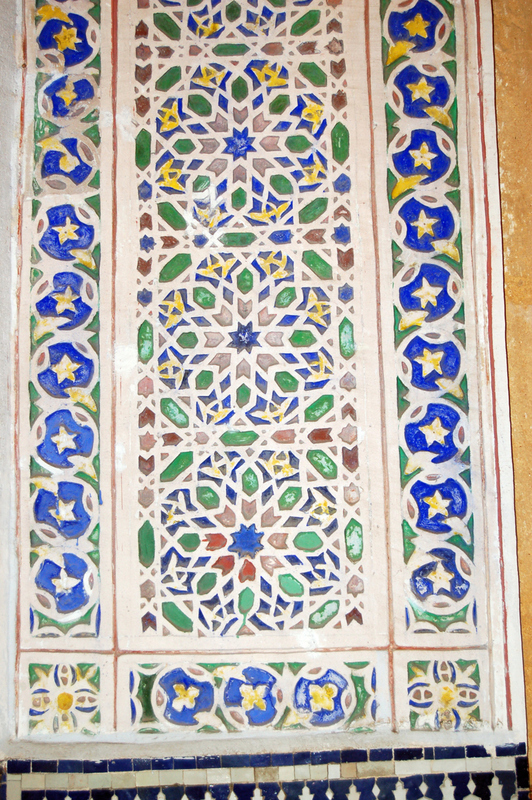 Because the images presented here are intended only as samples they have been greatly reduced in size and pixel count from the originals. 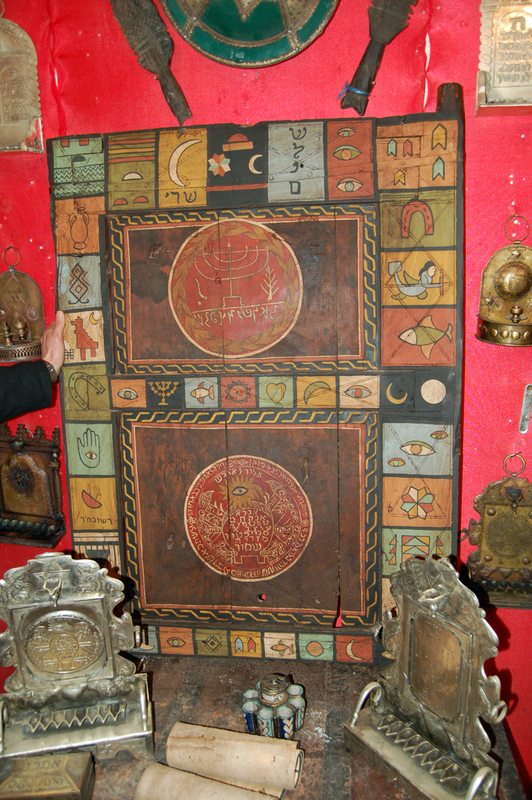 However you may click on any of the thumbnails below to view them at a fraction of original size. 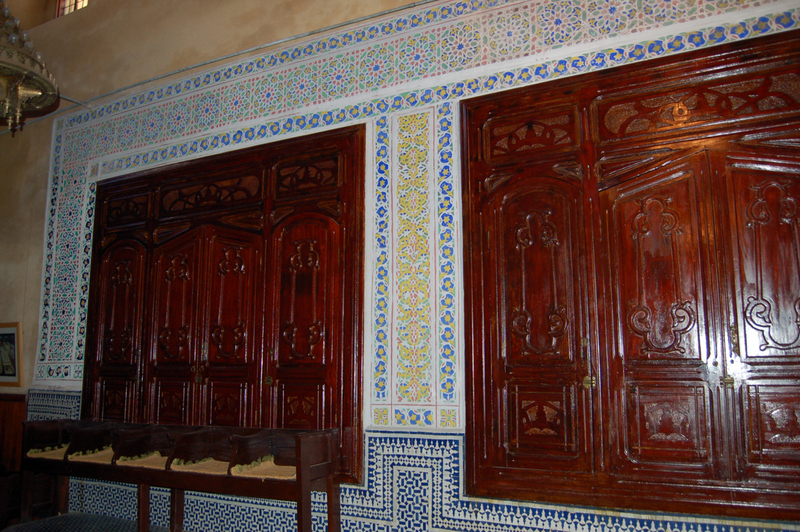 Use the Back button on your browser to return to thumbnail. 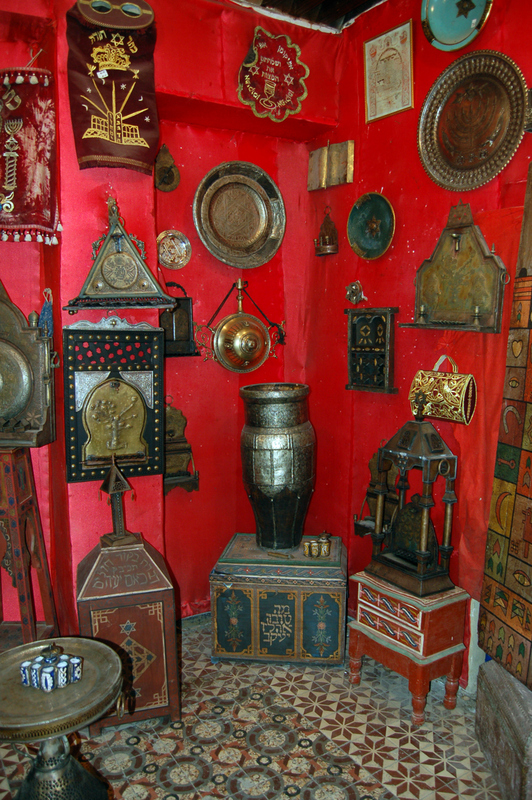 for one time a fee by perpetual license complete sets of Full size high resolution images from these sites are available to accredited institutions for on campus educational use, together with metadata in spreadsheet format, Complete catalogues are available upon request. 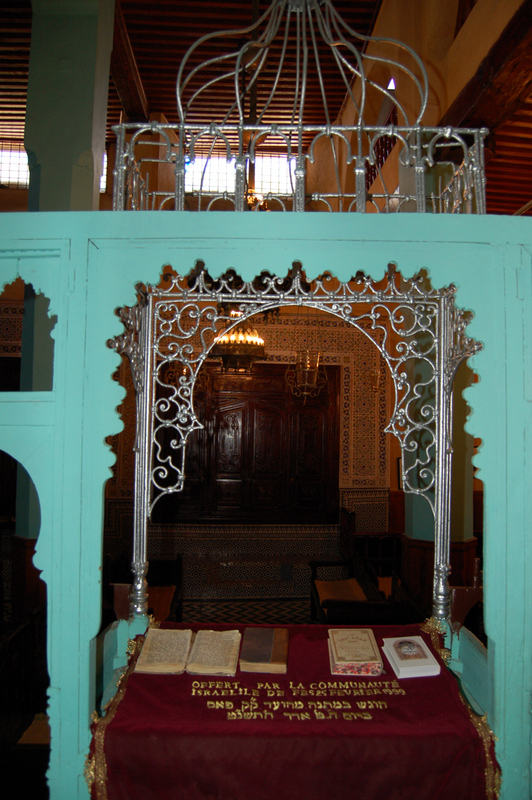 This synagogue was built in 1350 and is the only synagogue in Andalusia to survive the forced expulsion of the Jews from Spain after 1492. 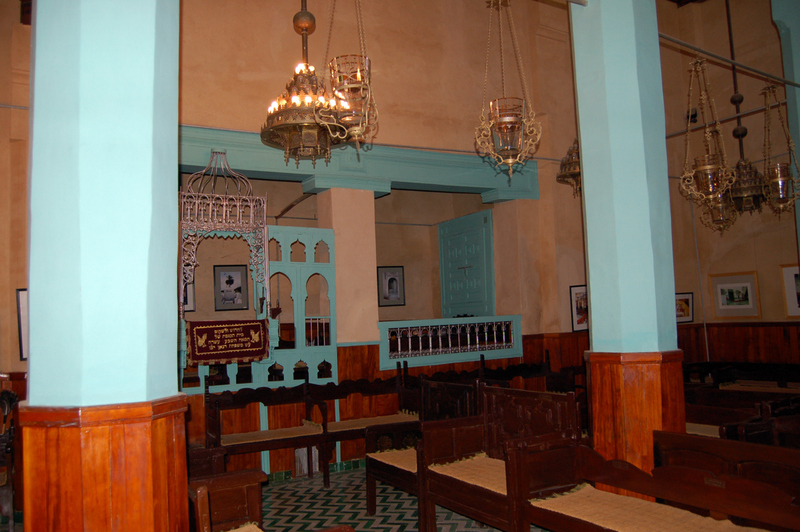 It was converted to a Roman Catholic chapel in 1588, and later became a hospital. 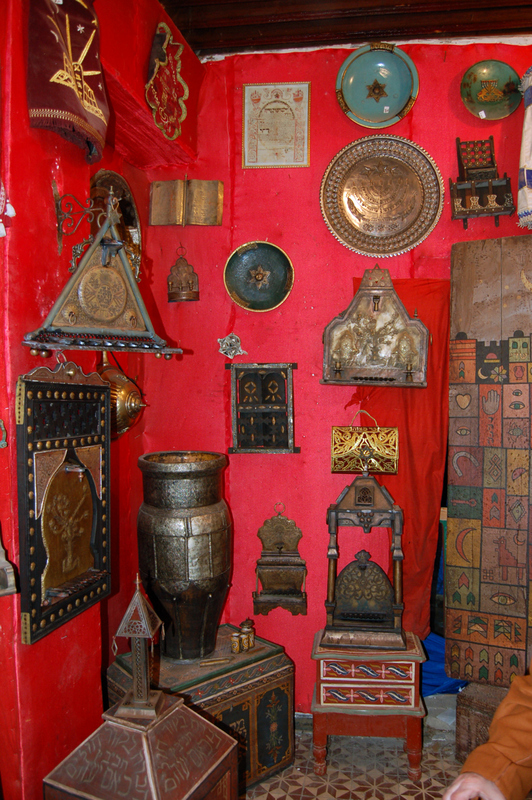 It is maintained today as a museum. 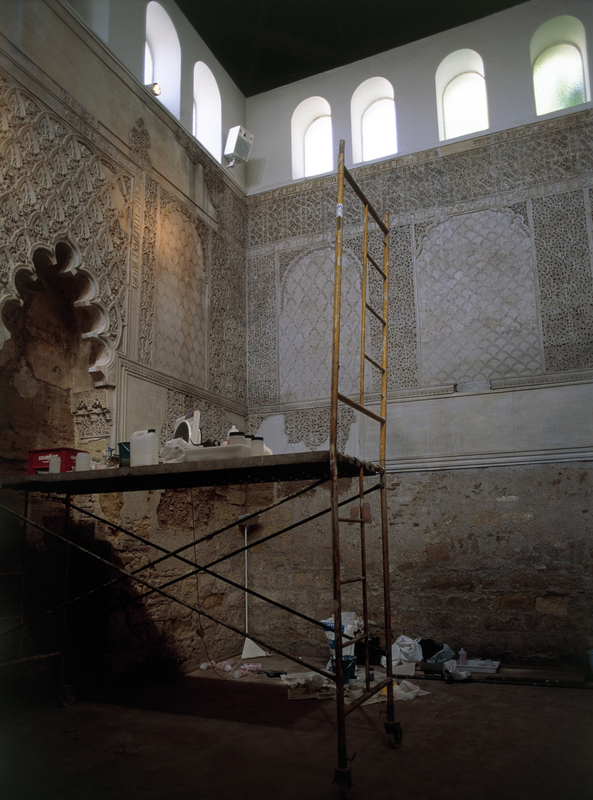 These images were taken in the 1990s during the restoration of the building. 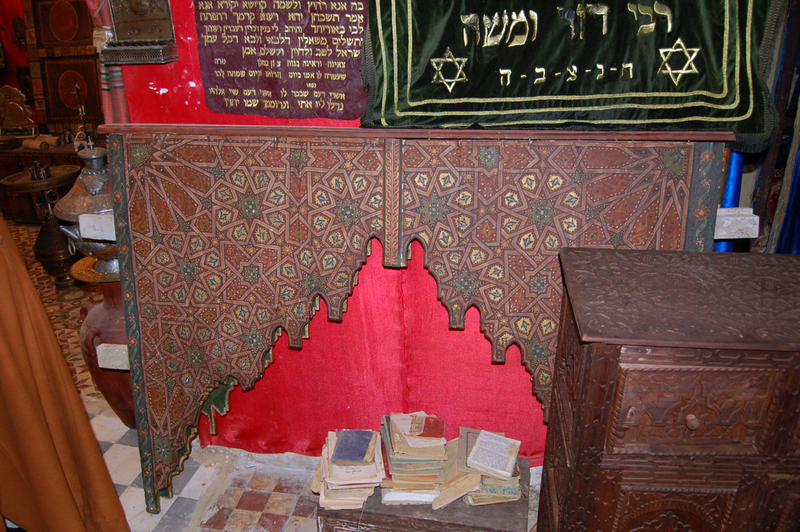 This synagogue was built in 1357 under the direct patronage of Simon Ha-Levi, who was Treasurer of King Pedro the Cruel. 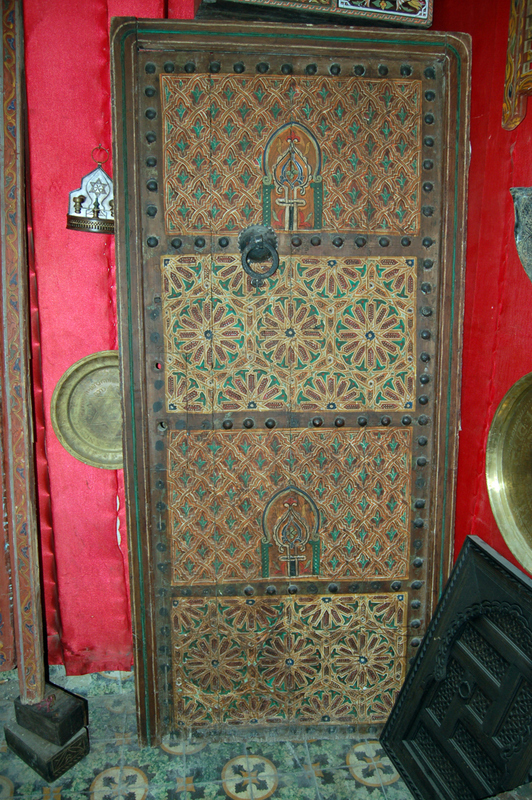 The king later executed his treasurer. 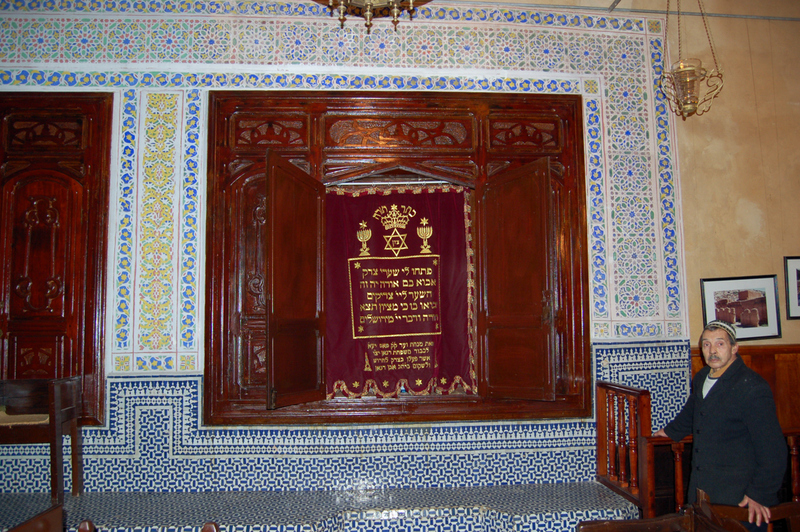 Nevertheless, there are inscriptions in Hebrew glorifying God, King Pedro, and Simon Ha-Levi. 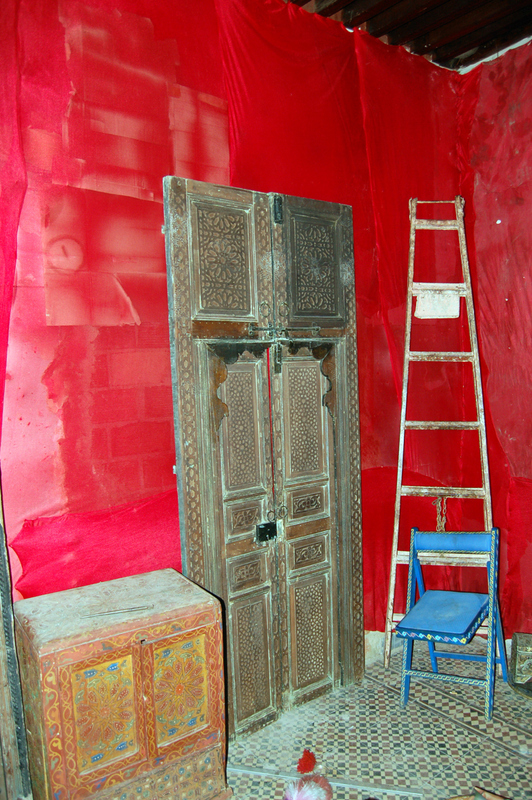 There are also some in Arabic. 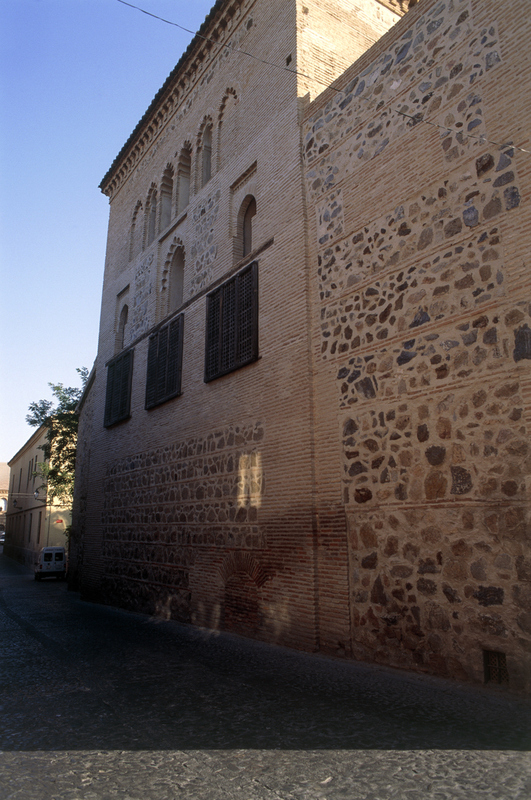 The exterior of the building shows a mixed stone and brick construction, often seen in Muslim buildings in Spain. 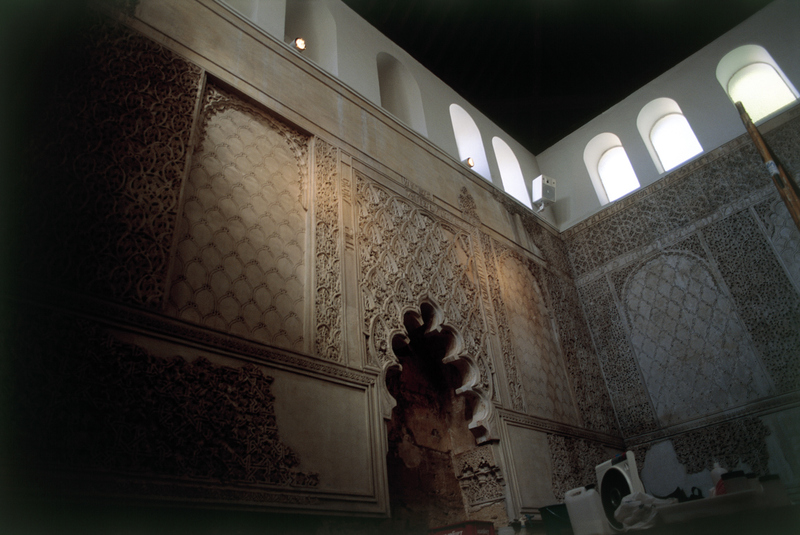 The elaborately worked gesso, or plaster, ornamented with stylized caligraphic inscriptions and floral and geometric motifs is typical of Islamic art of Al-Andalus, as we have already seen. 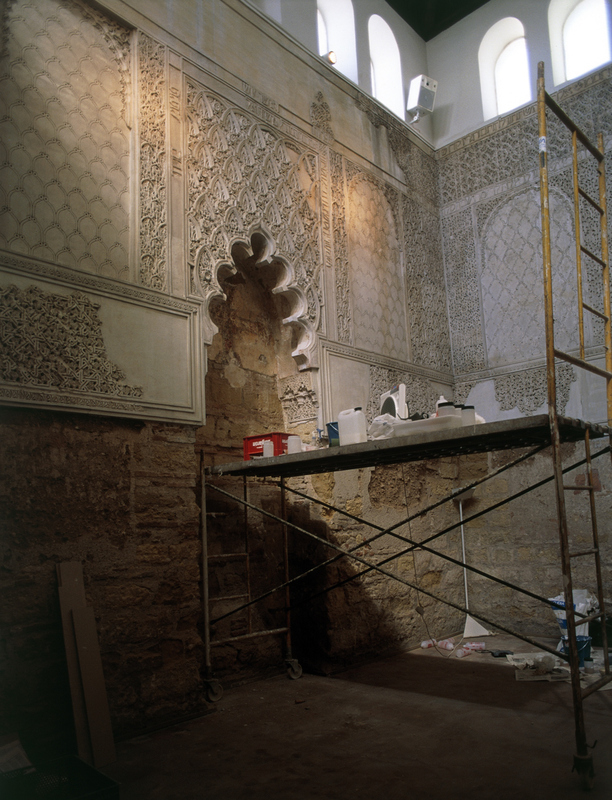 At one time these plaster walls were painted in brilliant colors, and with their lush patterns resembled the fabulously luxurious textiles produced in Al-Andalus. 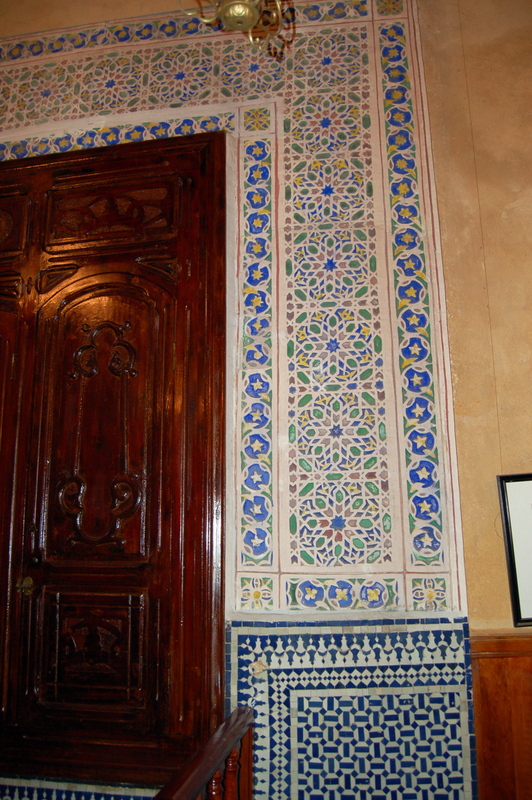 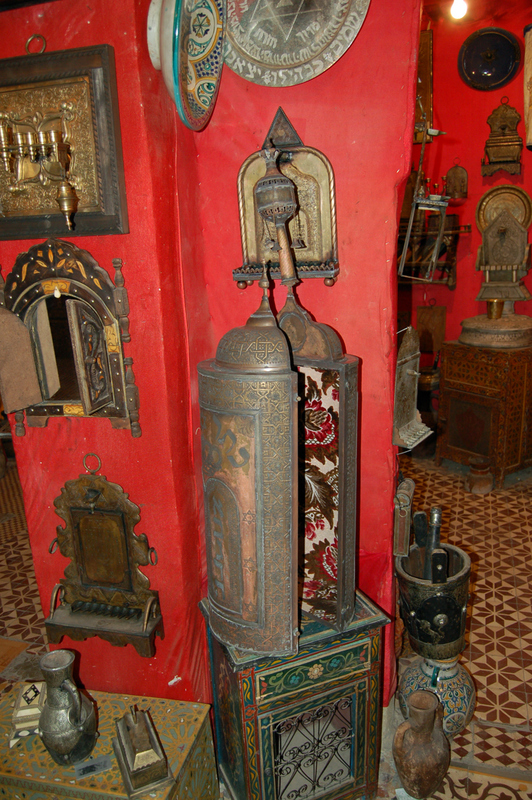 This kind of elaborate surface ornamentation became typical of Mudejar art, or the art of Muslim tradesmen working for Christian and Jewish patrons. 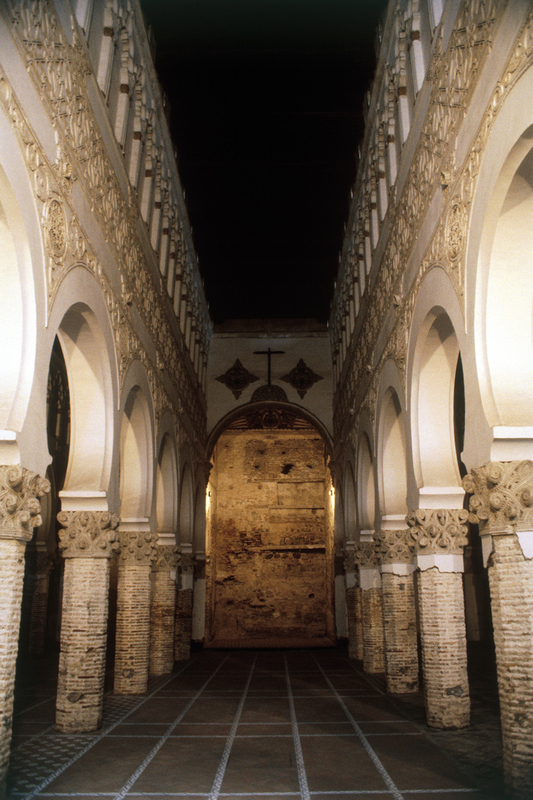 This was once the principal synagogue of Toledo, rebuilt in 1250 on the site of an earlier structure. 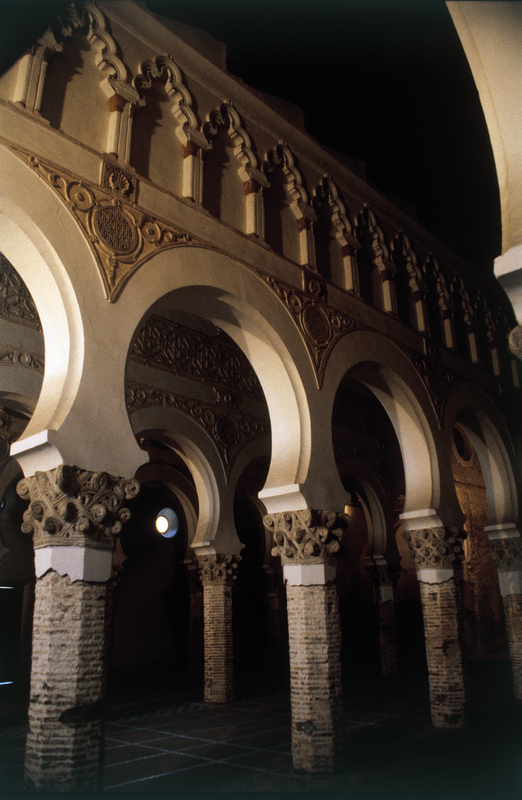 The octagonal brick columns, rendered in plaster are characteristic of Mudejar building technique. 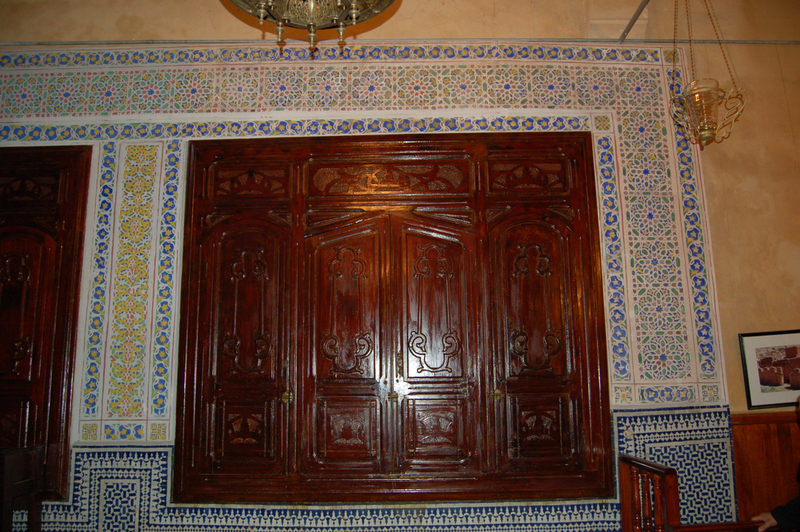 The use of the ultra-semicurcular arcade is another attribute of Mudejar taste. 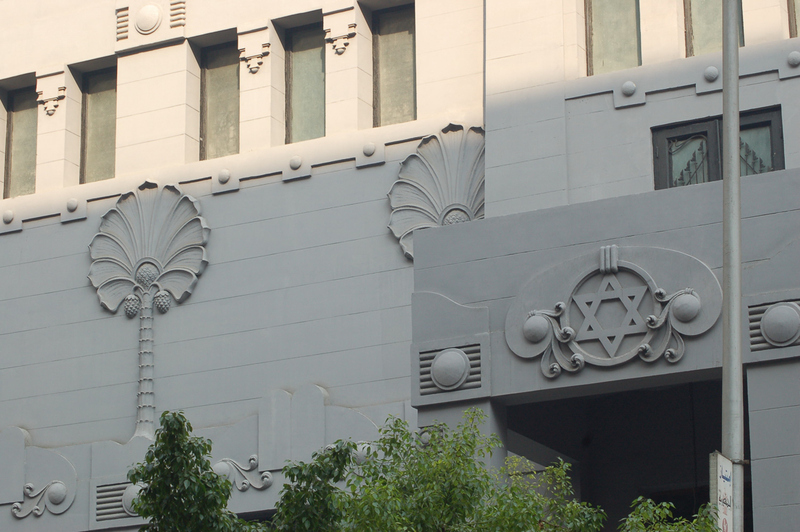 The capitals using vegetal ornament, in this case pine cones, again shows how ornamental strategies often seen in Islamic buildings can serve here in a Jewish temple to add beauty that does not conflict with ideological boundries. 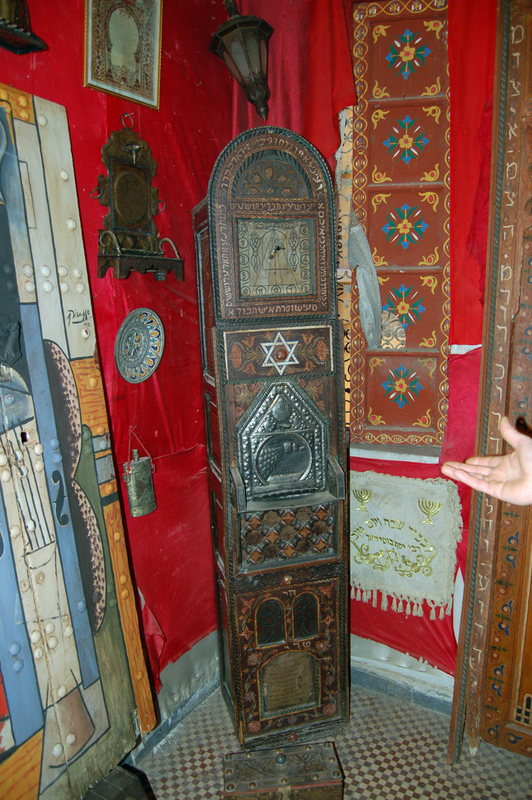 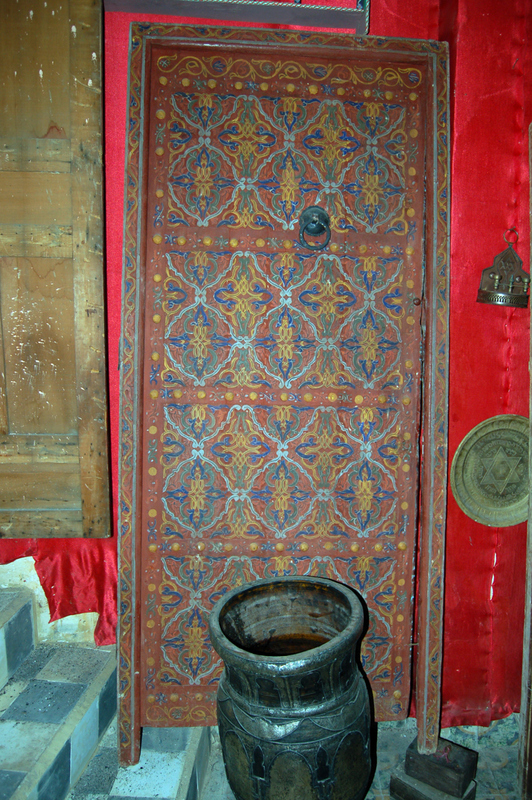 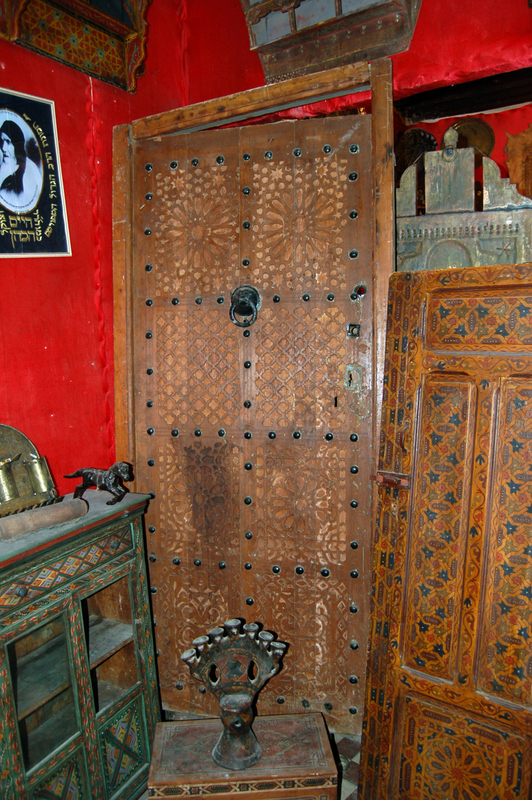 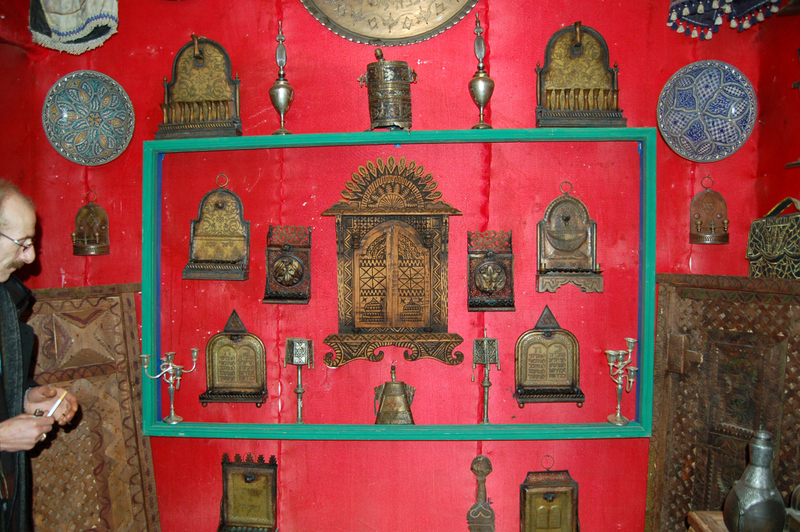 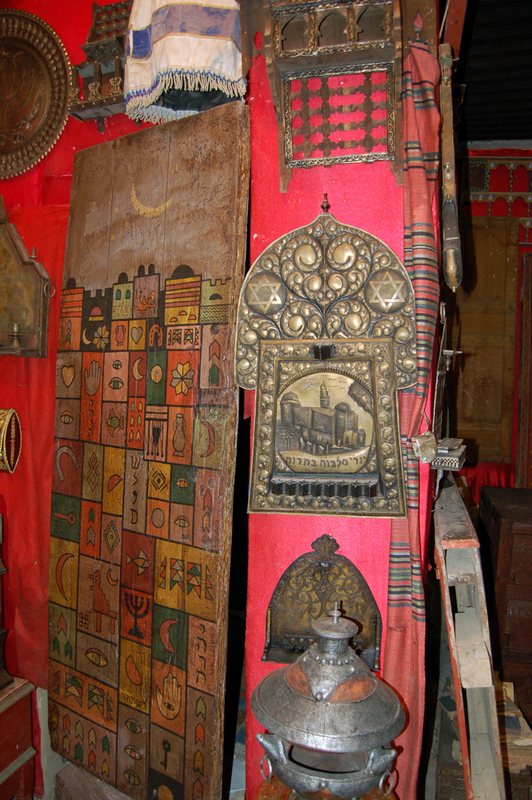 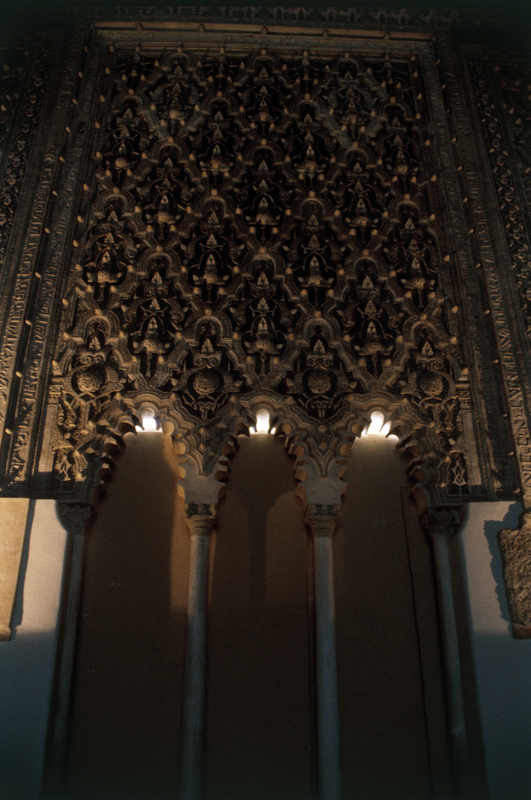 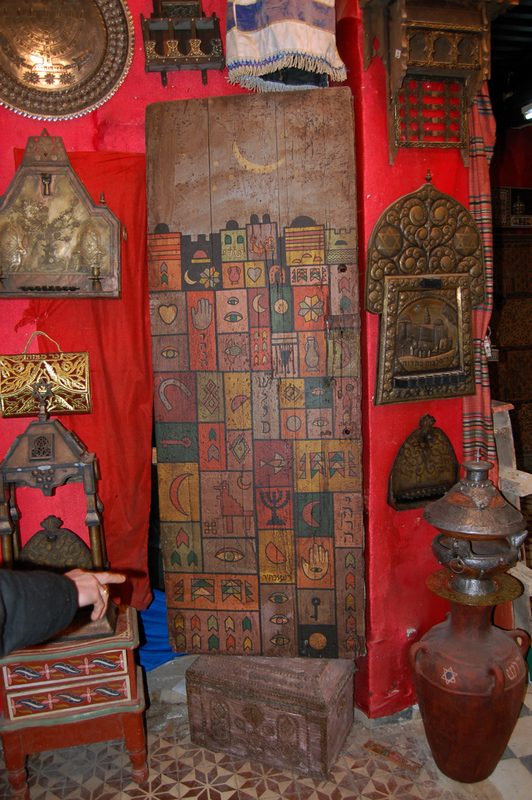 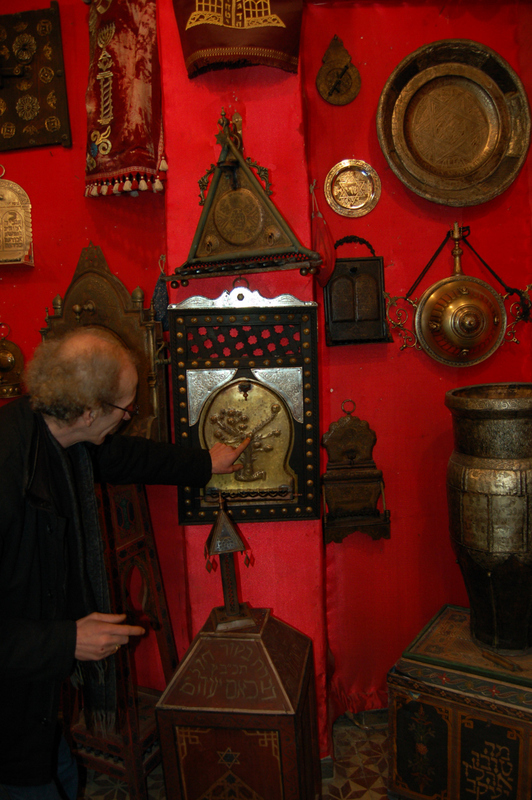 The use of the multilobular blind arcade above is another example of how ornamental elements commonly found in Islamic buildings of Al-Andalus could be incorporated prominently in a Jewish building. 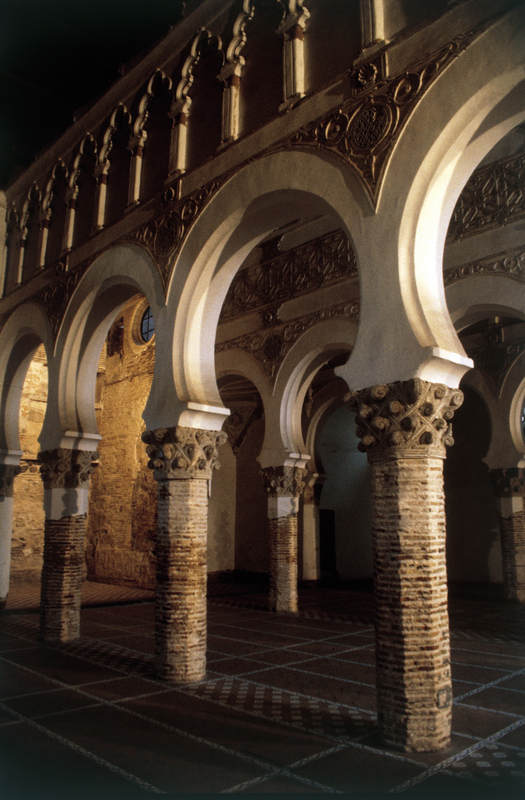 Even though this building has clear similarities with the hypostyle mosque construction of Muslim Spain and North Africa, it nevertheless was built, almost certainly by Muslim artisans, to serve a vibrant Jewish community as a place of worship, no doubt in accordance with their functional and ornamental program. 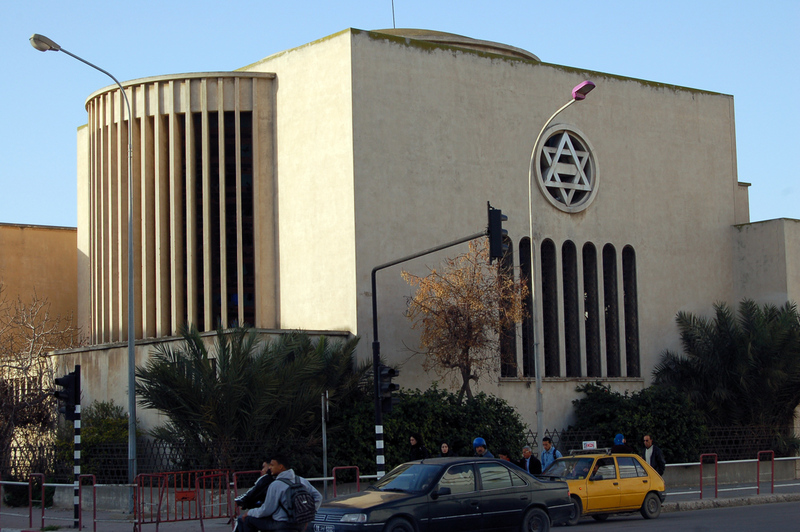 After the forced expulsion of the Jews, the building was later used for centuries as a Christian Church. 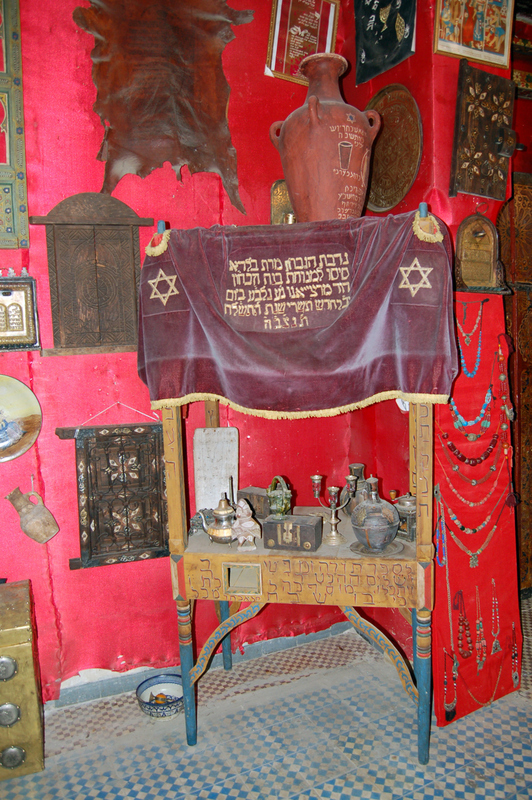 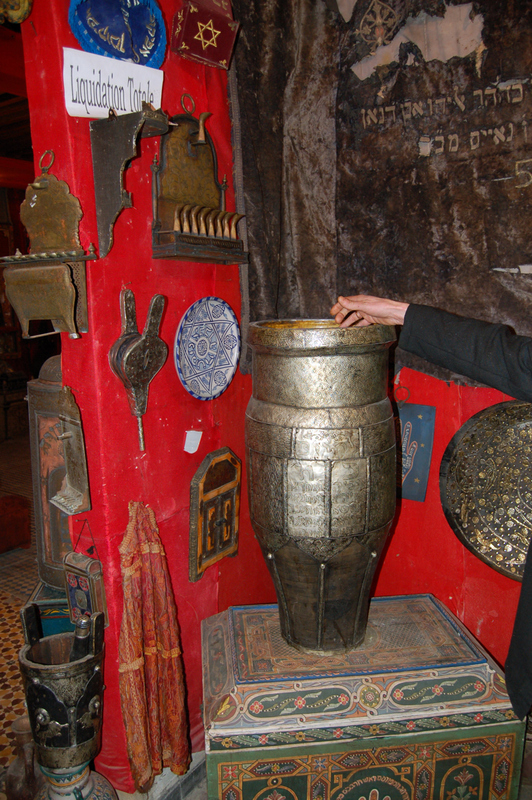 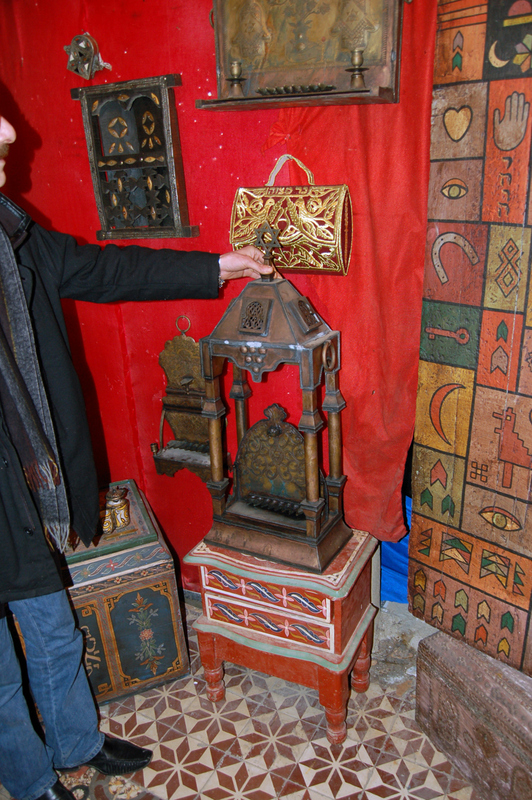 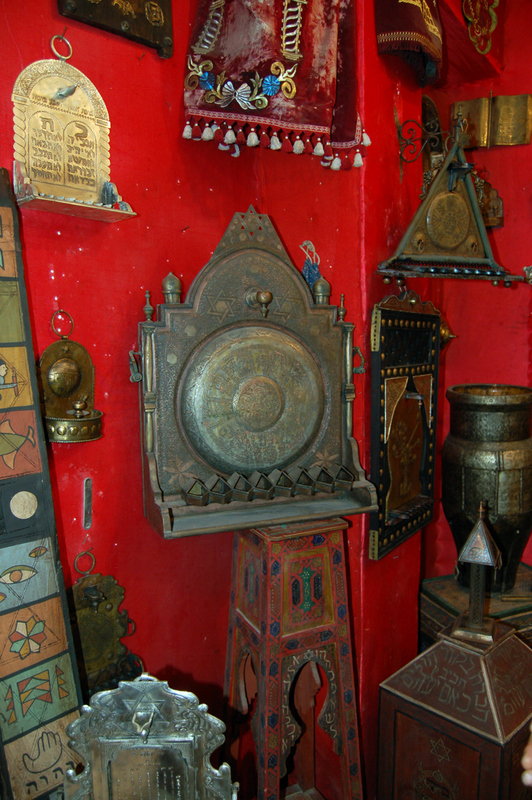 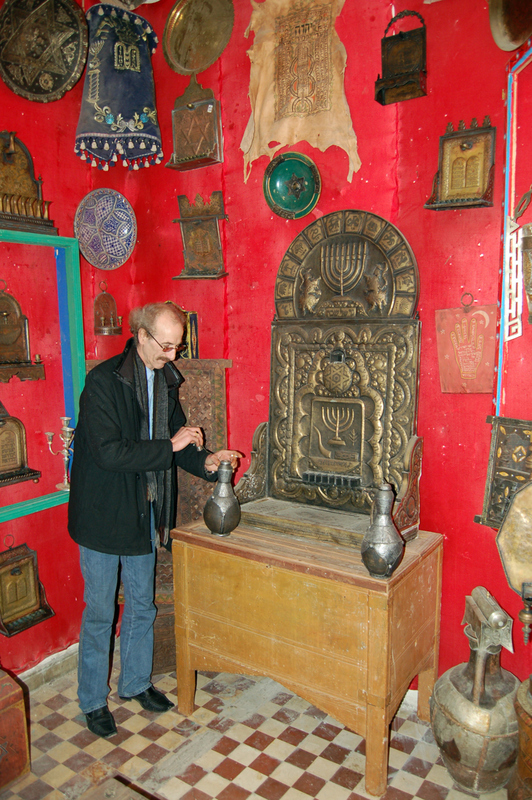 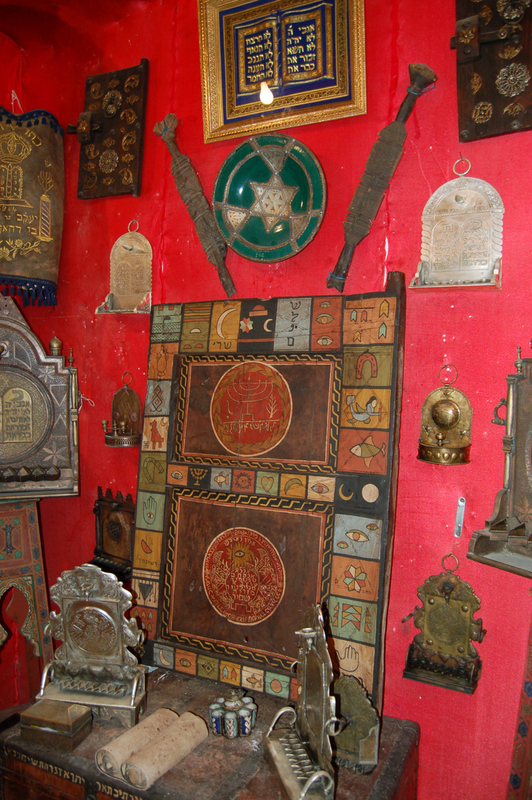 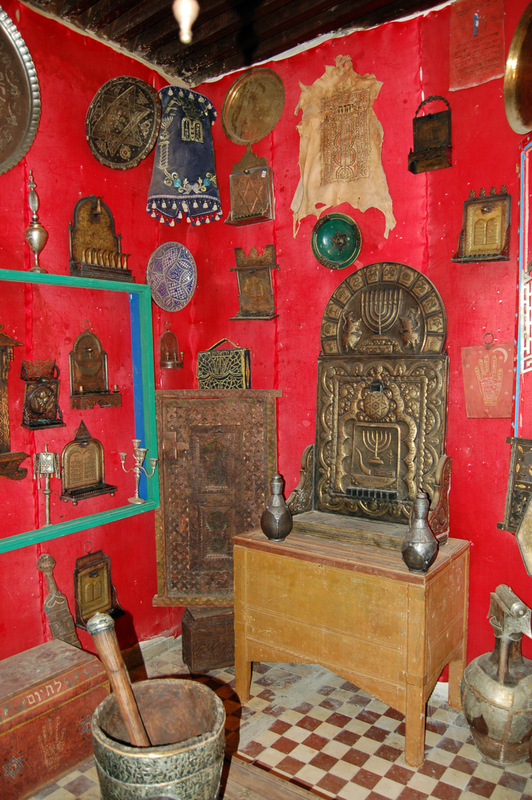 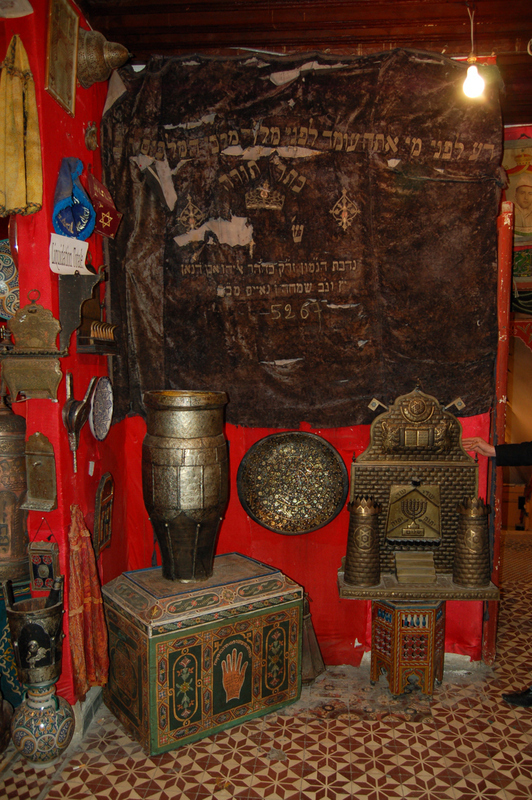 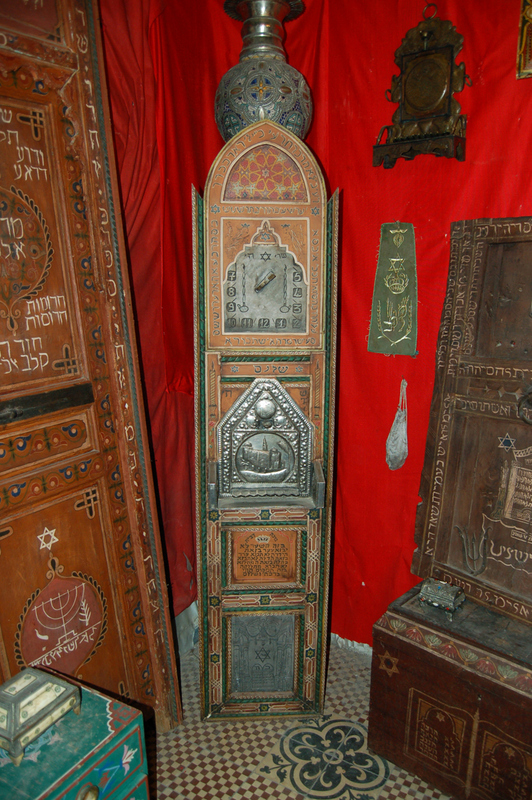 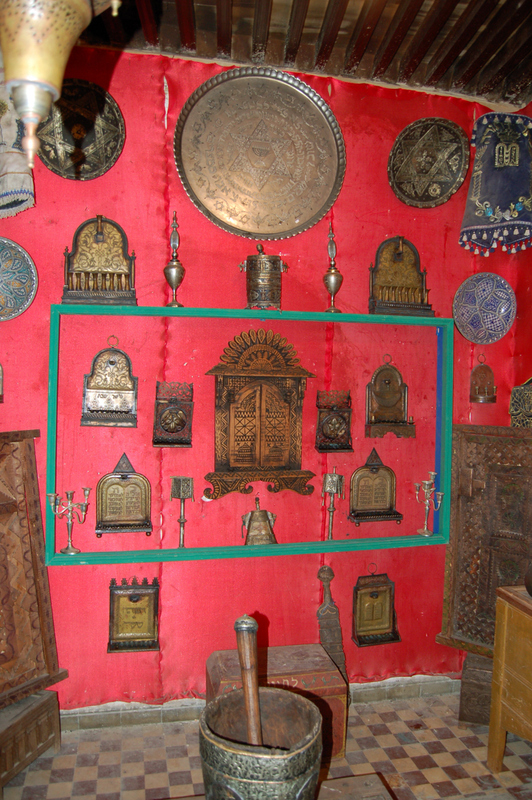 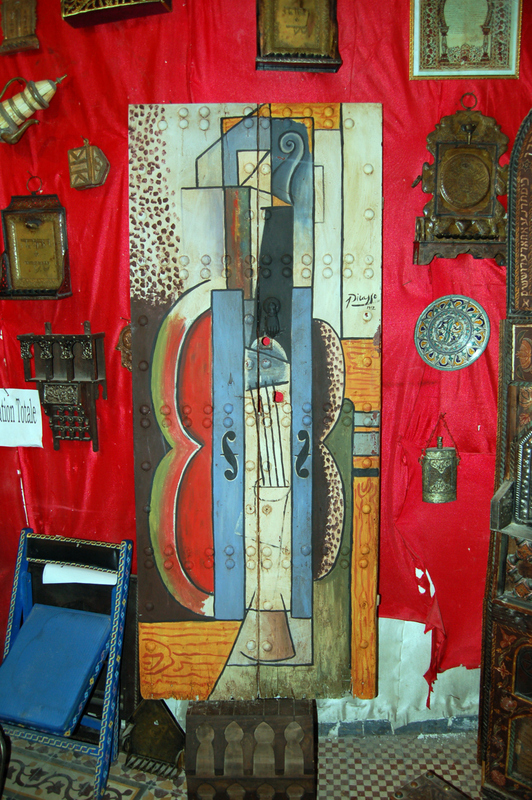 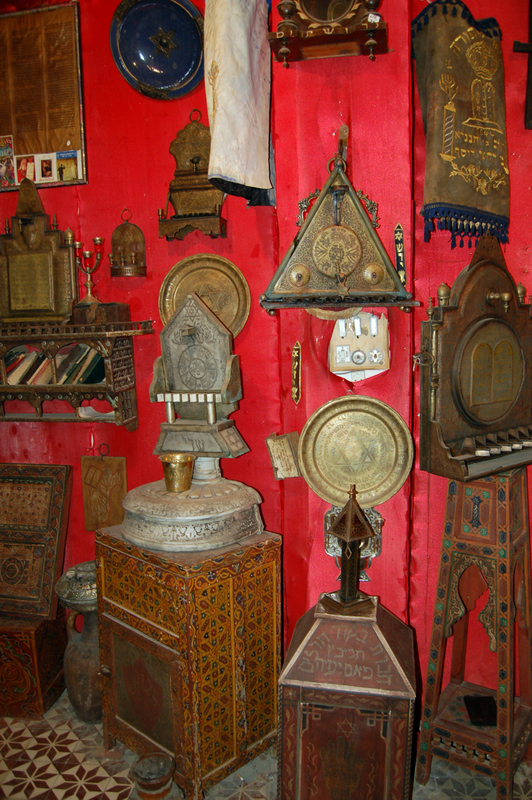 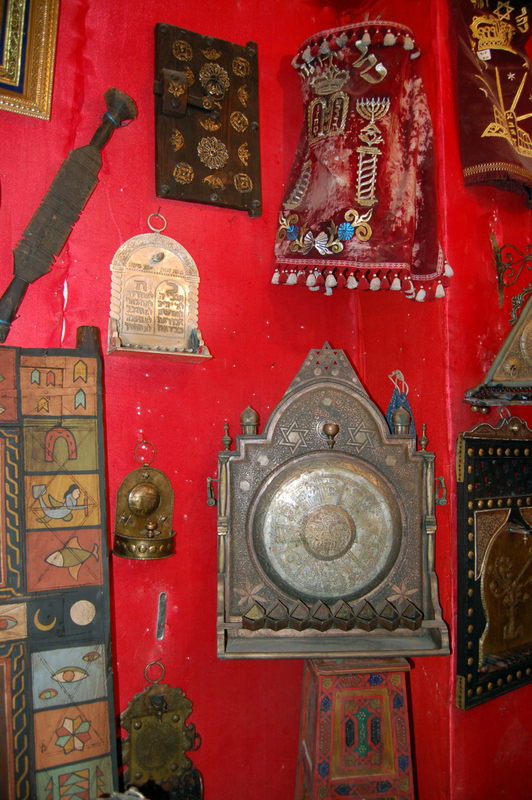 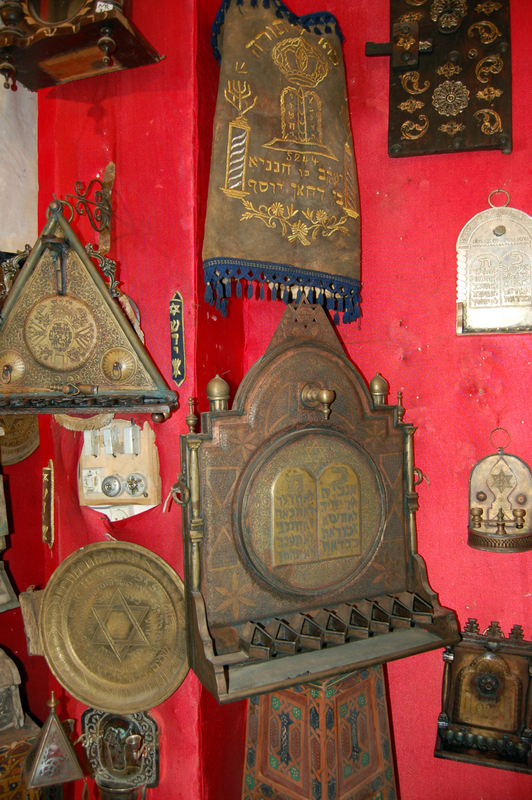 This private collection of Jewish religious art, including many artifacts hundreds of years old, belonged to a couple who had spent a lifetime collecting it. 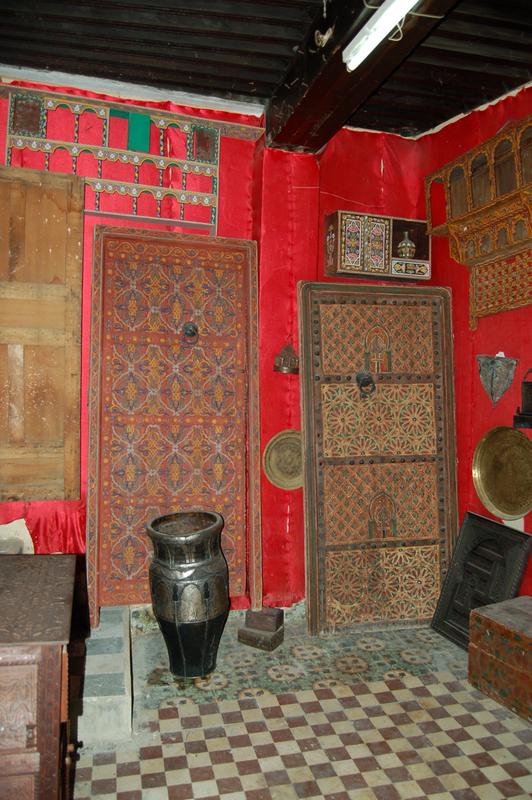 Upon their deaths, their son came from Paris to make arrangements for the disposition of the collection. 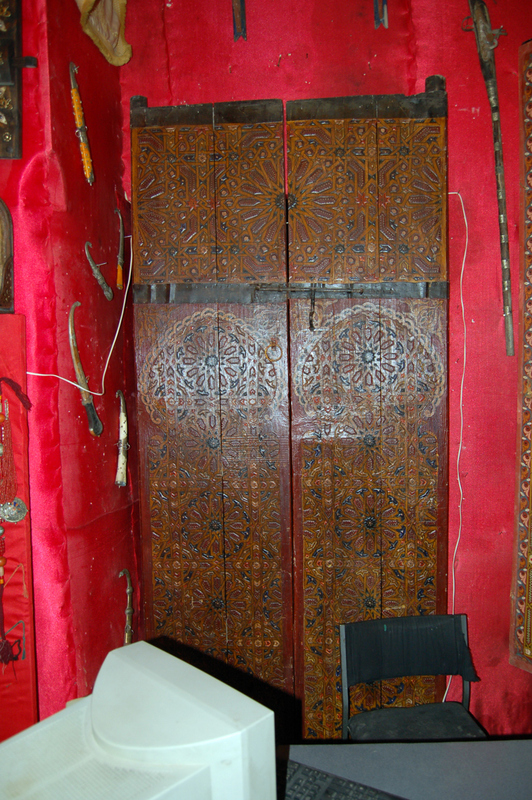 I happened to meet him during his stay and was permitted to make these images. 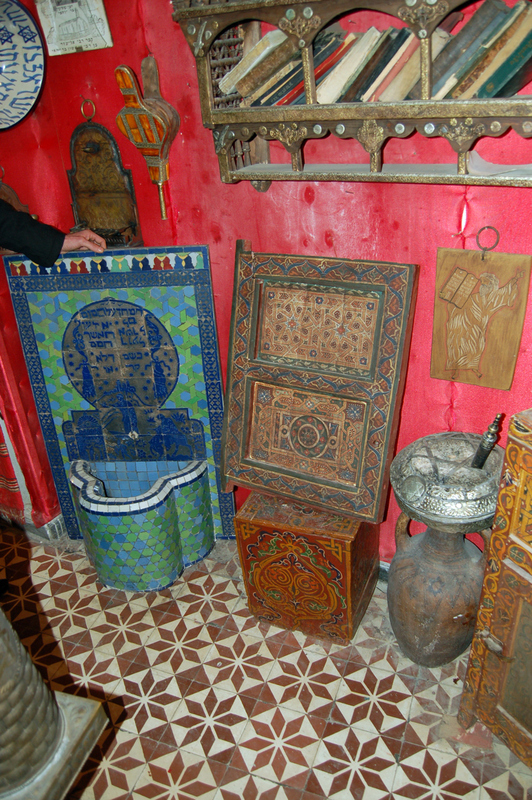 I do not know what has happened to this collection since January 2006 when I saw it. 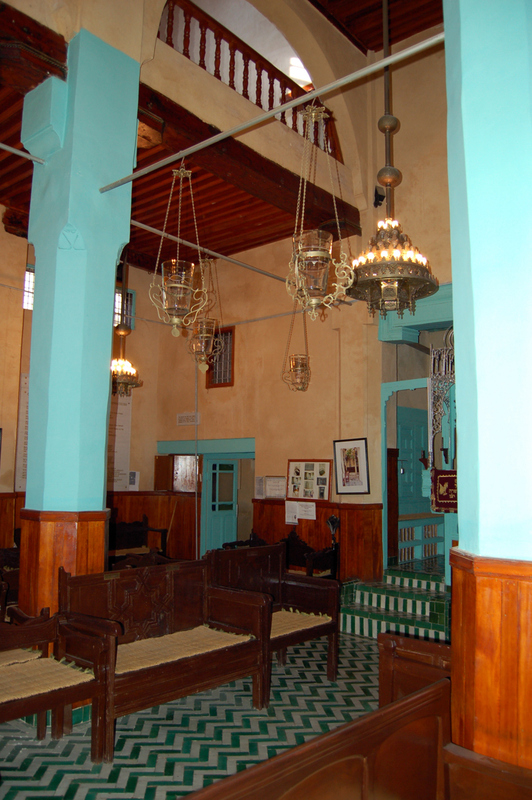 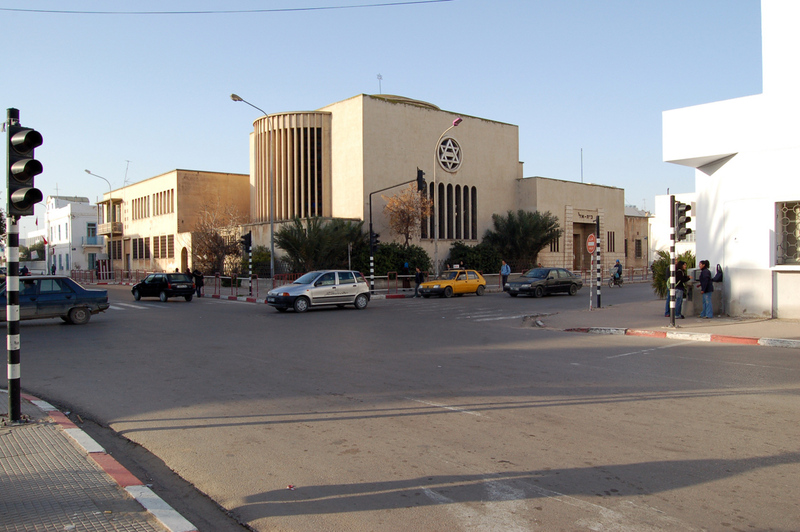 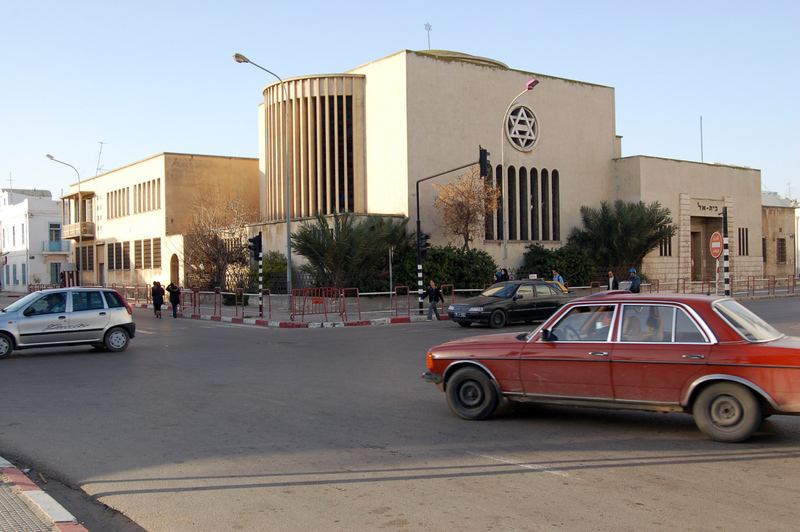 This is a large modern synagogue in Sfax, an important commercial center on the coast. 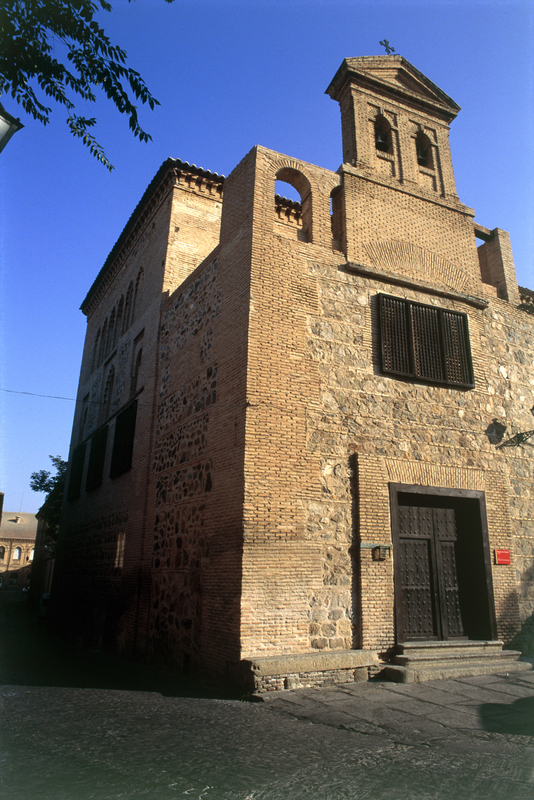 The building enjoys a prominent location just outside the old city walls in the modern city center. 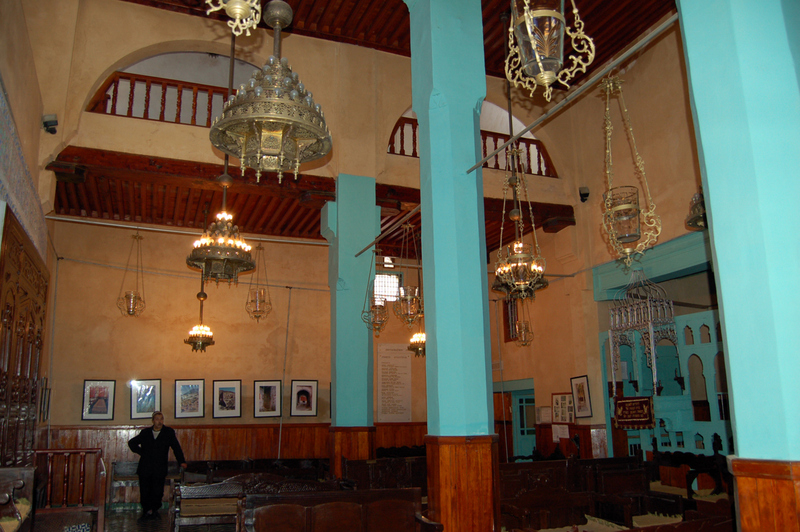 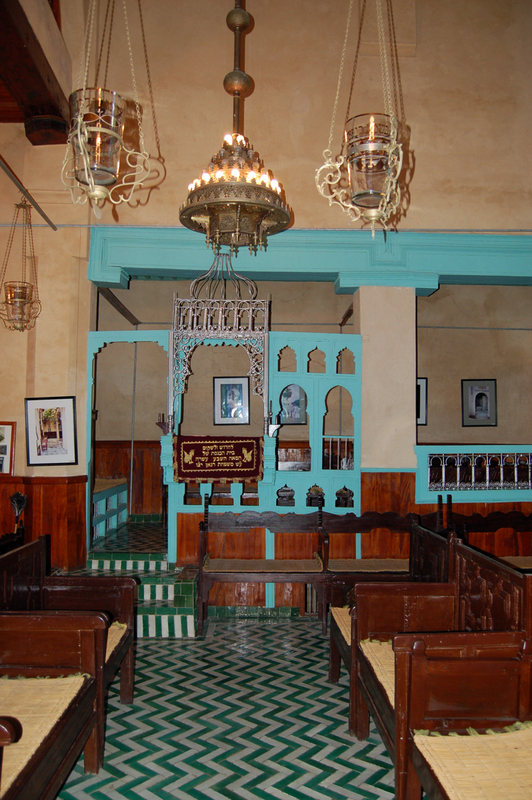 This is the Chaar-Hachamaim Synagogue in the financial district of Cairo. 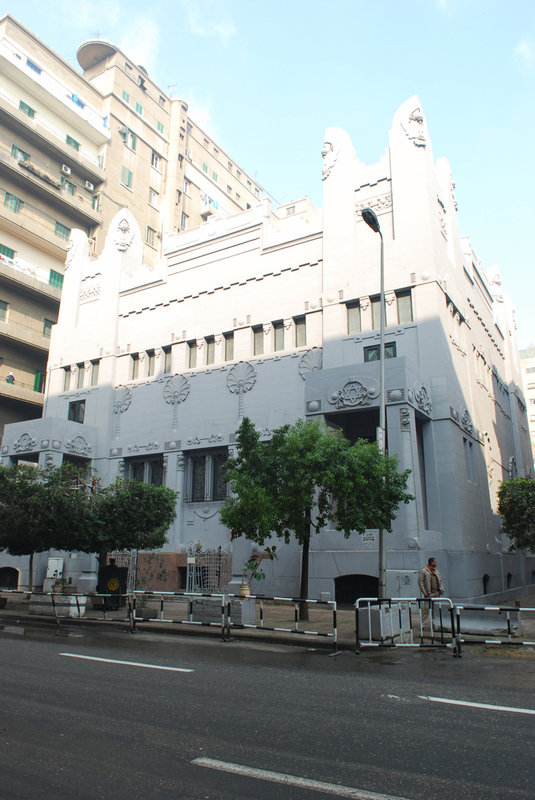 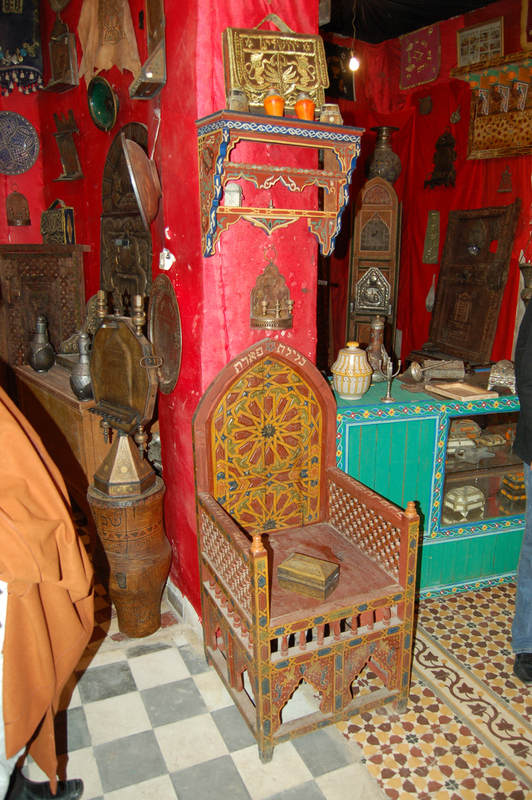 It was built in 1905, during a period of great economic activity and florescence in Egypt, by the Mosseri family. 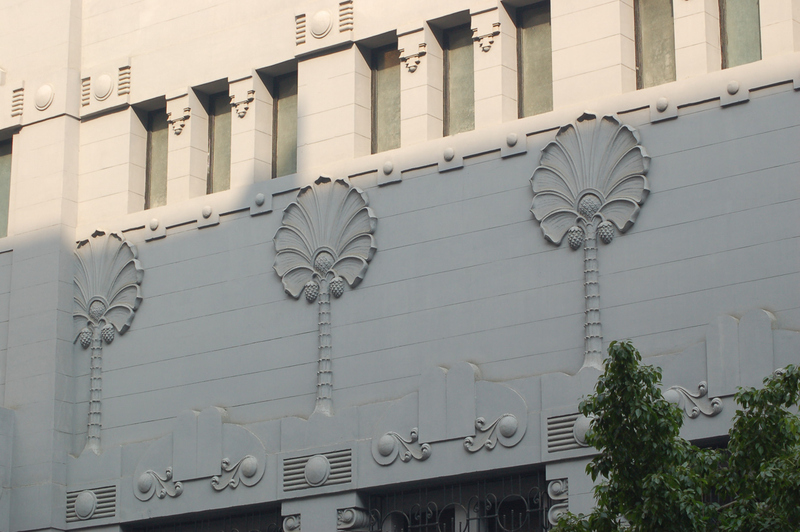 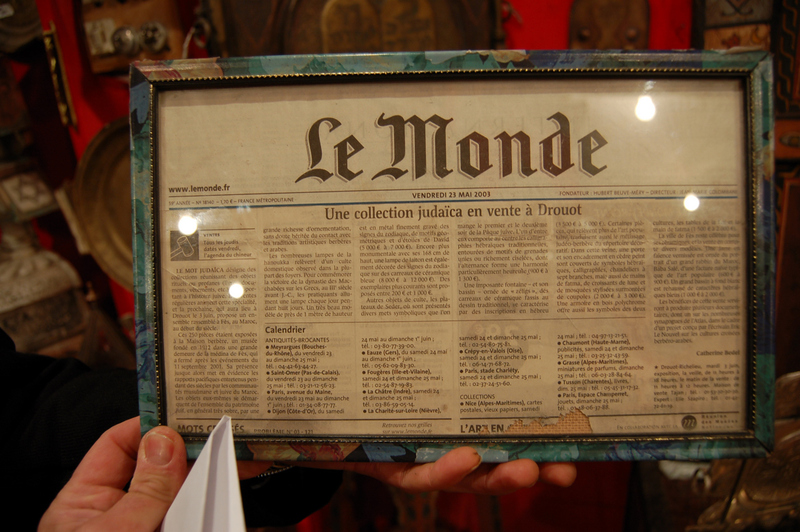 It is an outstanding example of the Art Nouveau style, then at the leading edge of international design. 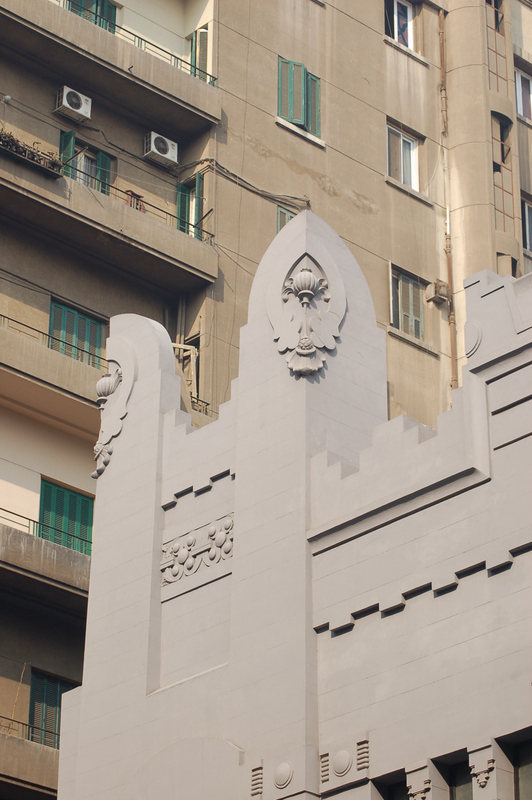 Other examples of this style make up the surrounding urban fabric.